"This is one of my favorite things to make once the weather gets a chill in the air. 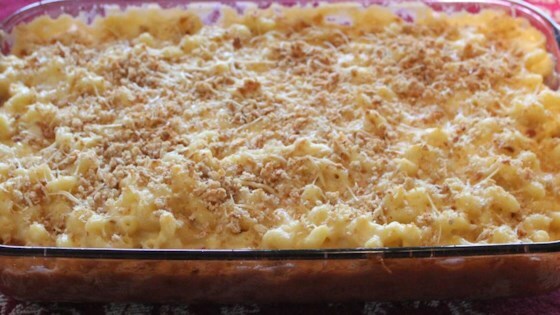 It's great for cheese-lovers (like myself) and works great as leftovers or at dinner parties! Truffle oil has by far been one of the best culinary purchases I have made. One little bottle has lasted me a year, and can be used with so many things, like this recipe. Top with a pinch of truffle salt!" Bring a large pot of lightly salted water to a boil. Cook cavatappi in boiling water, stirring occasionally, until cooked through but firm to the bite, about 8 minutes. Drain. Melt butter in a large pot over medium-low heat. Whisk flour into butter until mixture has a thick, paste-like consistency, about 30 seconds. Slowly whisk 2 cups milk into butter-flour mixture until smooth. Stir in remaining milk, increase heat to medium high, and cook, whisking constantly, until mixture is thick and almost boiling, 5 to 10 minutes. Stir Gouda cheese, Cheddar cheese, Swiss cheese, and 1 cup Parmesan cheese into milk mixture until cheese melts and cheese sauce is smooth. Fold cavatappi into cheese sauce; pour mixture into prepared baking dish. Stir remaining Parmesan cheese and bread crumbs together in a small bowl. Sprinkle bread crumbs mixture over cavatappi mixture and drizzle truffle oil over the top. Bake in the preheated oven until golden and bubbling, about 30 minutes. Cool for 10 minutes before serving. Great dish! Made on Christmas Eve and the family loved it! Used sotocenere truffle cheese instead of gouda, turned out really good. I halved the cheddar cheese and doubled the amount of bread crumbs (panko) and parmesan cheese for the topping. So good! I made it for a friendsgiving. Everyone loved it. I was worried kids wouldn't eat it with the truffle oil but they gobbled it up. I used truffle butter instead of regular butter and added mushrooms with a bit of sherry. This is an excellent dish and was very well received.